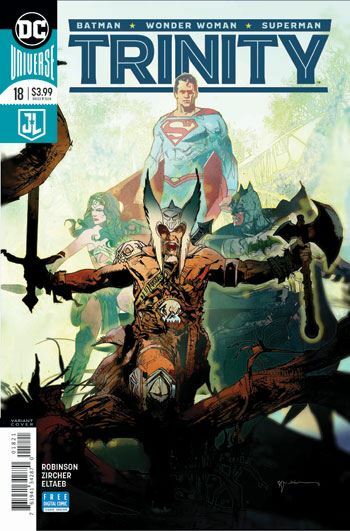 Superman, Batman and Wonder Woman spend Trinity 18 travelling through Skartaris, the lost world of the Warlord. Travis Morgan himself appears only as a projected image, but we do see Jennifer Morgan, his mage daughter, and the evil Deimos as the three heroes journey to Shamballah. This issue, indeed this storyline, will be more entertaining for those who know the classic Warlord series, but it still reads as a really fun fantasy adventure for those who do not catch all the references. And while Patch Zircher’s art is not Mike Grell’s, that scarcely matters. Everything is rendered in the same degree of wild detail, although without the large number of scantily clad women. I particularly liked his rendering of Shamballah. I really had a ball reading this issue. Robinson uses the debriefing of the three heroes to provide their individual insights as the story progresses, and adds even more fun to the tale, as well as more depth and contrast to the heroes. Hard not to laugh when Superman reveals that Batman names his unicorn “Biscuits.” Batman denies this, but you just know Superman is telling the truth. While the previous issue got the heroes into Skartaris, and this one takes them through it to Shamballah, a major twist takes place right before the end, upping the stakes for the next issue. 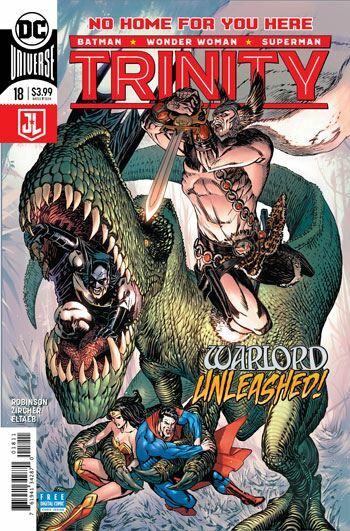 A real treat for fans of Warlord, Trinity 18 is perfectly capable of standing on its own three legs (six legs?) as well.